Join Stonyfield’s The Great Food Find! Knowing where your food comes from, how it’s made, and what’s in it is definitely important these days, since that will allow you to live a healthier life. As part of its ‘Know Your Food’ campaign, Stonyfield has launched an online food hunt that will take you to various websites in search of food products to fill your virtual shopping bag with. Every time you read a clue and find the right food item, you get some interesting tidbits of information about it, too. Apart from the fun of discovering some healthful and organic food products, what else do you get for taking part in the hunt? 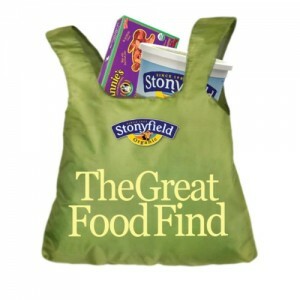 If you’re one of the first 50,000 people to fill up your tote, you can get great coupons from the online grocery list. You may even be the winner of the grand prize: a $15,000 kitchen makeover. Stonyfield’s virtual scavenger hunt began yesterday, but don’t worry–you’re not too late for the party! The hunt goes on until May 21, so you have plenty of time to take part in the game and maybe even win the big prize.